To make your own Greek yogurt, place 2 1/2 cups of plain, nonfat yogurt in a strainer lined with several layers of cheesecloth. Place over a bowl, cover, and refrigerate overnight. Discard the liquid collected in the bowl, and proceed with the recipe! Great Raita. I prepared it with one small addition and that was adding one teaspoon of cumin. It provided it with an exceptional taste and authenticity. Excellent recipe! 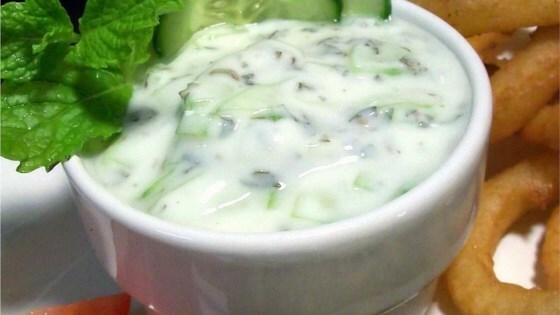 I have been searching for a cucumber raita recipes for a while and this one is the best I've found. Thank you.